For beginning knitters and experienced knitters alike, an afghan is a practical way to put skills to use, as afghans are both decorative and useful. Knitting small squares makes this project easily portable, and the small squares offer a way to practice new stitch patterns and to practice knitting techniques. Choose a synthetic fiber for washability or a natural fiber for elegance. Determine the size you would like your finished afghan to be. With these measurements in mind, figure out how many squares you will need. Six-inch and 12-inch squares are easy measurements to work with. A 60-by-84 inch afghan will fit a full-sized bed, a 48-by-72 inch will fit a twin bed and a 30-by-36 inch afghan will fit a crib. Smaller sized afghans are good for lap throws and receiving blankets. Knit each square according to the pattern you have chosen. Consult the label on the yarn to determine the appropriate size knitting needle to use. Weave in all loose ends with a yarn needle. Wash and dry the squares. If you are using a natural animal-based fiber such as wool, block the squares. Decide how you want to arrange your squares. If all your squares are alike, you may skip this step. If you have used a variety of patterns or colors, lay them out on a flat surface and arrange them in a pleasing pattern. Sew groups of squares together to form strips that are the length of your finished afghan. For instance, if your finished afghan is to be 72 inches long, and your squares are 6 inches each, sew 12 squares together. Weave in all ends with a yarn needle. Sew the strips together side-by-side lengthwise to form the body of the afghan. Weave in all ends with a yarn needle. If desired, knit or crochet a border around the entirety of your afghan. Weave in all ends with a yarn needle. If you are an avid knitter, save the gauge swatches from your projects and sew them together to make a crazy-quilt-like afghan. Use a single color of yarn with each of several different stitch patterns or a single pattern in multiple colors of yarn for a unified look. For the best results, use the same type of fiber (for instance, only acrylic) in all of your squares to make your afghan easier to care for. 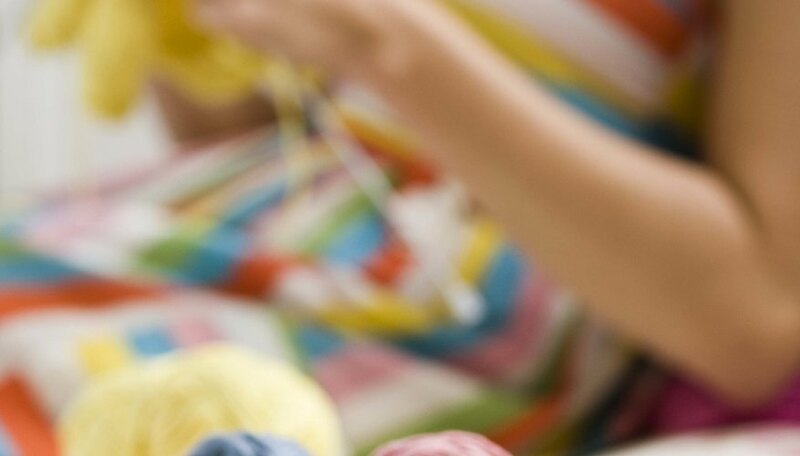 Mixing natural fibers with synthetic fibers will mean your afghan is not machine-washable. Choose a pattern that is easy enough that you will be able to complete enough squares for an entire afghan, but interesting enough that you will not get bored with it. Bethany Seeley has been publishing articles since 2000 on topics relating to church history and theology. She received a Bachelor of Arts in psychology from Houghton College and a Master of Arts in church history from Gordon-Conwell Theological Seminary. She also loves art, cooking, gardening and books of all types.